A Company Profile Page with IMD? Placed within the Equipment Guides section, Company Profile pages are a blank canvass that extends across a double page spread. What you place on this canvas? Well that is entirely up to you. As you will see in the slideshow below we already have a wide and varying range of styles and methodologies in how our customers use this space. For the most part those who have participated in the past have submitted 300 word articles about their companies and accompanied them with logos and miscellaneous pictures related to their organisations. Others have used the space to focus on a specific product and again with the help of some good photography or artwork they have proven to be more than just an advert. Let’s not forget how IMD marketing benefits all work together in a continuous distribution flow exposing and promoting you further and wider than first impression might perceive, your company profile page won’t just be seen by our 8,072 current print subscribers. It will reach the 41,000 (approx.) online readers visiting hosting websites such as Slideshare and Issuu where the IMD is also available and even further still every new company profile page that we create is posted right here on millinginternational. And then there is of course the circa 300,000+ visitors expected on our www.internationalmilling.com expected throughout the year where you profile will be displayed. When you choose to participate in a Company Profile page you will be in direct contact with our design team who will take on board any feedback you have throughout the design process, giving you the required amount of control in creating the page to your exact design and style specifications. Interested? Take a look through the slideshow for inspiration on how you could stand out heads above your competitors, then get in touch with me to begin creating your masterpiece. A Company Profile page in IMD is so much more than an advert. Email sent to all IMD companies. I have taken this opportunity to contact each and everyone personally to remind you, if not inform you, of the benefits of submitting an equipment guide into IMD 2012/13. The ‘Equipment Guides’ section offers you a platform on which to promote your most valuable products. It is a fantastic tool for guaranteeing an entire page devoted to your company in IMD and enhancing your exposure far beyond your competitors. Don’t forget that IMD has an already impressive circulation, which will be increased this year to meet a growing demand. This means that your completed equipment guide would reach circa 8000 readers in print and be viewed by 290,000 (approx.) readers online from all across the globe. The beauty of these guides is that for you they are available completely FREE-OF-CHARGE, so it would be a shame to miss out! However there are ways in which you can add value to your guides that are available for a small fee. For £150 you can add product photos and a logo to your guide, which will not only stand out amongst the other guides, but will also give customers a clear indication of your product features. Take a look at the examples of last year’s guides below. Our design team will do the rest! The categories in this year’s guide are: Cleaning, Colour Sorting, Coolers & Driers, Drop Forged Chain & Components, Dust Filtration, Elevator Buckets, Extruders & Expanders, Hammermills, Mixers & Grinders, Packaging, Pellet Press, Rollermills, Sieving & Sifting, Storage and Weighing & Scales. If you have any queries or require assistance in completing your guides please feel free to contact me. But act now to avoid deadline disappointment! Quadrant is a leading global manufacturer of high-performance thermoplastic materials in the form of semi-finished products and finished parts. Since their establishment in 1996 they have expanded into 20 different countries with over 2,000 staff. Their expertise lie in engineering thermoplastics and composites that are superior in performance to metals and other materials and are used in a growing number of applications, primarily in capital goods. Together with leaders in a wide range of customer markets, Quadrant is continuously developing new areas of application. Other specialities include custom nylon castings and finished parts with part of the QEPP portfolio being the full service SYSTEM TIVAR ENGINEERING for lining of bulk transport and storage containers. All of us at IMD would like to once again welcome their participation in this years directory. Continually striving to expand the company’s global brand, we have been working passionately on a new website design over the last few months to give visitors a user-friendly experience. The new online platform offers great insights into the world of food safety diagnostics, covering topics such as mycotoxin analysis, food allergen & gluten testing. Visiting our new website, you will be delighted with the cleaner look and it will provide you with more improved ways to discover our products and services. The new website also includes a “Knowledge-Center,” where you will find extensive background information on a wide array of contaminants and toxins, including mycotoxins, food allergens, veterinary drug residues and melamine. Our new integrated dynamic online product-catalog gives you an excellent overview on our products and services. If you register, you will be able to see a lot of new features, including newly launched product videos. Romer Labs’ 30 years of expertise in food safety diagnostics comes handsomely packaged in a great and easy-to-use online platform with this new website! IMD Update: June 15, 2012. 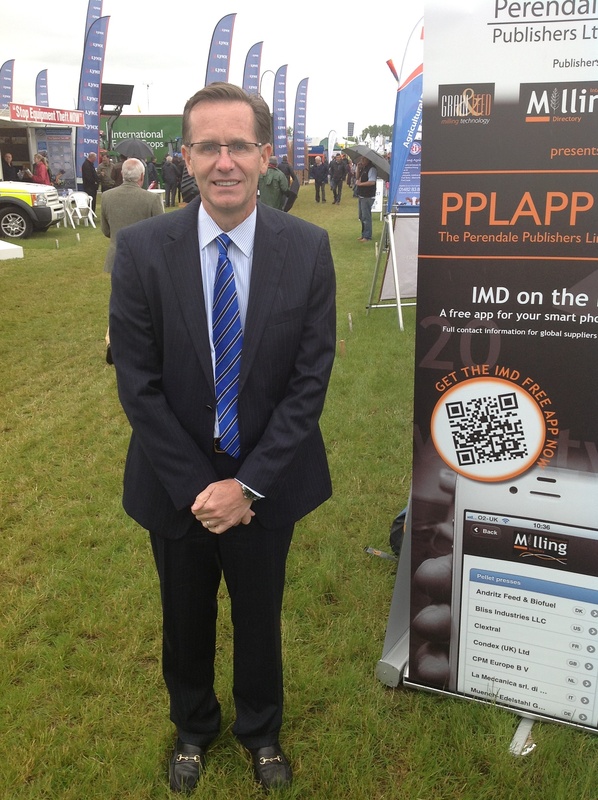 Hello and welcome back everybody that attended Cereals 2012 in Lincolnshire, UK. It truly was a spectacular showcase with some 400 market leaders all packed into one place, many of whom I am pleased to see are listed with IMD. I know that our representatives who attended had a great time meeting all of you and hopefully those who weren’t registered when we met them will be filling in their forms now! The IMD office has been a little quiet this week with many of us visiting Cereals 2012, but by no means did that prevent us from continuing the important work that has been going on behind the scenes. I have again managed get in touch with most of you in between other jobs just to catch up and make sure that you are getting the most out of your IMD listings. If you wish to enhance your listing and we haven’t already made contact please feel free to get in touch simply by clicking my name at the bottom of this post. We at IMD are confident in our abilities to tailor each marketing to tool to your specific needs and cost requirements and I am always happy to hear new ideas! Having said that, once again your response has been fantastic and I have enjoyed speaking to so many of you this week and finding the best ways to enhance your profile with IMD. With that in mind I would like to remind those of you that already have or who would like to participate in our equipment guides section please treat it as a matter of urgency and contact me as time is running out and it would be a shame for you to miss the opportunity. Remember, the equipment guide is a great opportunity for you to advertise some of your products and guarantee an entire page in the directory devoted to your company. If any manufacturers would like to learn more about equipment guides please do not hesitate to email me, I have attached some samples below to give you a taster of what you could, but shouldn’t be missing out on! Lastly I would like to inform you that I have managed to extend the deadline one last time for you to check your details, add to your listings and send in your equipment guides. The final deadline for the printed International Milling Directory 2012/13 is June 22, 2012. I wish you all a very pleasant weekend! Dan Basse Addresses Cereals 2012, Lincolnshire, UK. In an exciting first day at Cereals 2012 the event welcomed Dan Basse, President of AgResource Company. In a talk hosted by Agri Intelligence, the leading commentator and adviser to the UK and Chinese governments addressed Cereal 2012 visitors on World Food Supply and Demand. His talk covered global crop marketing prospects saying that the key factors driving prices for the foreseeable future would be a combination of weather (in terms of drought and moisture stress in key production regions), biofuels and their demand for agrimony-based feedstocks and South East Asia and in particular China. He focused more of his comments around wheat supply and demand taking in corn and soybean production towards suggestion of the current volatile period for grain prices and a bullish period ahead for wheat in particular. The Ag President stated that two-thirds of a cereal farmer’s net revenue in the USA now arises from marketing activities. Based on his calculations he also mentioned, that GM technology in grain production had not delivered any corresponding increases in yields, however they had taken some of the volatility out of seasonal variation in output. Mr Basse also took time to visit the IMD stand and meet our directors who were pleased to welcome him to IMD and discuss international milling. He will return to his home town Chicago, USA, having no doubt enjoyed his time at Cereals 2012 and even the UK weather! Another new addition to this year’s IMD is UK based ingredients company, Prinova Europe. Prinova provide a source for high-quality ingredients for food & beverage, health & nutrition, animal nutrition, flavour & fragrance, and personal care industries worldwide. Their dedicated, state-of-the-art R&D laboratory and knowledgeable staff allow them to provide special expertise in food and beverage additives, animal nutrition, and applications work. Originally formed in the United States Privova has grown since its establishment in 1978 (then named Greenfield Thorpe Company) from having just one office employee to operating from nine bases worldwide, including in France, Germany, Spain and the UK. Owing to their global sourcing expertise, international stock locations and purchasing power Prinova promise to make sourcing simple, strategic and successful and even offer services such as in-house grinding, granulating and blending facilities. Everybody at IMD wishes a warm welcome to Prinova Europe and we hope to be play an important role in their long term growth and success. The UK’s leading technical event for the arable industry kicks off this week and we are delighted to be one of the many industry leaders attending. Cereals 2012 will feature over 64ha of stands and live demonstrations of sprays & sprayers, crop plots, post-harvest technology and much more. That will come as good news to the 490 exhibitors attending the event, including us at Perendale Publishing. You will find us at stand number G814 where our team of directors will be looking forward to meeting and having a friendly chat with you. Unfortunately I won’t be able to make it due to this incredibly busy period for IMD as we approach our deadline but I hope to receive plenty of feedback regarding IMD from our International Sales Manager Darren Parris who will be in attendance. Companies not yet registered with IMD will also have the opportunity to fill in a quick form to enjoy the many benefits of being part of the worlds most comprehensive directory for the milling industry. As the leading arable event in the UK, Cereals also provides the platform for lively debate and seminars on the years key issues such as food versus environment, raising crop output and CAP reform. Panellists include farm minister Jim Paice, NFU president Peter Kendall, IBERS director Prof Wayne Powell, CPA chief executive Dominic Dyer, CLA president Harry Cotterill and Martin Nesbit, DEFRA’s director of EU and International Agriculture. Tickets to the event are available at the gate on each day so there is no need to miss out if you haven’t already booked. Visit www.cerealsevent.co.uk to find all of the information you need on Cereals 2012, including a list of exhibitors and directions to the site. For those attending, have fun, stay dry and we look forward to meeting you. New to 2012/13: Roff Industries (Pty) Ltd.
IMD welcomes Roff Industries (Pty) Ltd. for 2012/13. Roff Industries (Pty) Ltd. are providers of high quality medium size maize roller and hammer mills to the Sub-Sahara African Market. Based just 2 hours west of Johannesburg, South Africa, their expertise is based on 20 years of service to the African market where they are operational in Namibia, Swaziland, Zimbabwe, Botswana, Zambia, Angola, Kenya and even parts of Europe including Belgium. Part of Roff Industries’ quality in service aside from their expertise is the ability to produce and install equipment within a very short space of time. A 4000kg/h plant will normally be installed and operational in less than six months from the date of order. They have a wide range of products beyond medium sized milling equipment including, sifters, conditioners, feed mixers, cleaners and are a distributor of Jacob piping systems in South Africa. I am very pleased to have Roff Industries (Pty) Ltd. participating in this years IMD and I look forward to working with them in the future. Manufacturers of milling equipment, cleaners, degerminators, sifters, conditioners and feed mixers. Ditributors of Jacob piping systems in South Africa.